A total of 23 migrants heading to the US were rescued Wednesday by a Mexican security forces in the border city of Nuevo Laredo, Tamauliupas, according to Mexican news accounts. According to a news report which appeared in the online edition of El Diario de Coahuila news daily, a Base de Operaciones Mixtas (BOM) group of state and federal security units found the migrants Tuesday at a residence under construction in Constitucional colony in the city. Some of the victims told authorities that they were waiting to be released by their captors after their families paid tribute. Local Mexican criminal gangs routinely kidnap migrants heading to the US and hold them until tribute can be paid. If they refuse or money can't be raised, the victims are executed. The worse example of this practice took place three years ago August in San Fernando municipality when a local Los Zetas group demanded tribute be paid from a group of migrants they were holding, but were rebuffed. The San Fernando gang executed 72. The migrants in the Nuevo Laredo group rescued were from Mexico and from central America nations including seven from El Salvador, Honduras and Guatemala. Meanwhile near Matamoros, three armed suspects were shot to death when they encountered a Mexican Army road patrol. According to a separate news report in El Diario de Coahuila, the suspects were traveling aboard a Chevrolet Suburban SUV along the Matamoros to Reynosa highway when they were signaled by the patrol to stop at around 1315 hrs. The patrol was fired on by the suspects. Army return fire hit the suspects, killing them. Also in Tamaulipas in the central section of the state, a Base de Operaciones Mixtas (BOM) group detained three unidentified armed suspects said to have been involved in shootings in the area. The arrests took place along the road between Villagran and Magueyes. The security force also seized two rifles, a revolver and several balaclavas. A total of three men were found executed in a southern Chihuahua municipality Monday, according to Mexican news accounts. A report which appeared in the online edition of El Diario de Juarez, said that the three victims were found on a road between Creel and Guachochi in Guachochi municipality. They victims were identified as Marco Antonio Bustillos Grijalva, 33, Saul Aldo Garcia Villalobos, 31, and his brother Victor Paul 25, all of Guachochi. They were shot multiple times in the head and chest. The grim find was phoned in anonymously to Chihuahua state police, which located the murder scene Monday. The rise in violent crime in southern Chihuahua is what is termed the 'cockroach effect', according to José Antonio Enriquez, president of the Observatorio Ciudadano de Prevención, Seguridad y Justicia de Chihuahua. According to a news account which appeared on the website of El Siglo de Durango news daily, improvement in security in the larger cities of central and northern Chihuahua state have forced criminal gangs into the more vulnerable mountainous regions of southern and western Chihuahua. 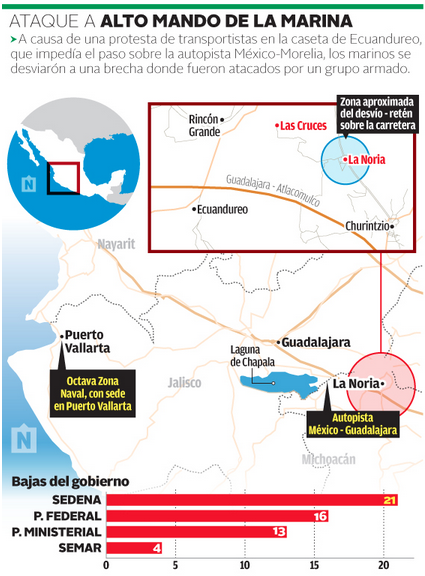 According to an unnamed source with the Chihuahua state Fiscalia General del Estado (FGE) or attorney general, the warring parties include the Juarez and Sinaloa cartels, which are squaring off in the region for territory and trade routes. According to Señor Antonio Enriquez, murder rates have increased dramatically in the La Tarahuara region, which includes Guadalupe y Calvo and Guachochi municipalities. 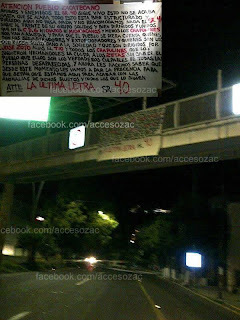 Murder rates in Chihuahua city and Ciudad Juarez are currently around 30 per 100,000, while rates in Guadalupe y Calvo is 118 per 100,000 and Guachochi, 122 per 100,000. By comparison at the peak of drug war violence in 2010 in Ciudad Juarez, murder rates were 229 per 100,000 and in Chihuahua city, 118 per 100,000. Señor Antonio Enriquez also said that the mountainous communities in southern Chihuahua are remote, a problem also cited in an earlier statement made last week by Chihuahua CGE Carlos Manuel Salas. Those municipalities are traditionally areas which have been in the past neglected due to the extreme remoteness of some areas. According to Señor Antonio Enriquez, poverty also plays a roles in criminal activity in the region. Ten of the 23 municipalities have very high levels of poverty with 25 percent of the population in extreme poverty. The population is composed of mainly peasant and indigenous peoples. In a related story, two men were sent to prison Saturday for their alleged role in the shooting at Reforma de Mesa in Guadalupe y Calvo July 21st. According to a news report in El Norte Digital, Silverio Esmin Chaparro Olivas and Uriel Gutierrez Martinez were sent to the Centro de Readaptacion Social (CERESO) in Parral after the southern delegate of the FGE discovered the two had been admitted to a hospital for gunshot wounds. The shootout at Reforma de Mesa took the lives of six individuals, two of whom were decapitated. There shooting was so intense at least 389 rounds of AK-47 ammunition had been expended. 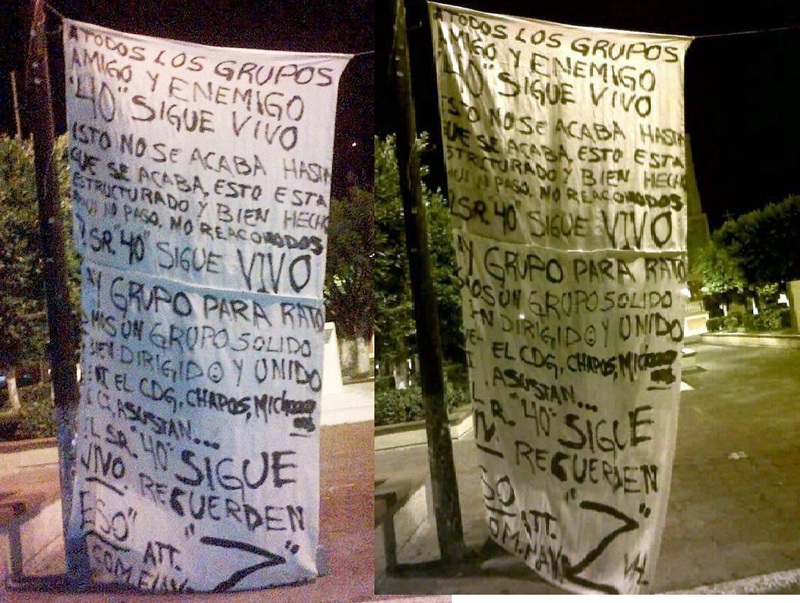 A new self-defense group appears in Aquila, Michoacán. Today, bullets are not only directed at individuals who fight to bring justice to their fallen family members, such as Marisela Escobedo Ortiz, Nepomuceno Moreno, and many other heroic fighters, but now also against citizens who form an organization to defend peace. The cowardly armed suppression of a group of civilians peacefully protesting on Monday in the town of Los Reyes, Michoacán shows that with Enrique Peña Nieto, we have entered a new phase in the “war” against insecurity that is simultaneously creepier and paradoxically more hopeful than during the presidency of Felipe Calderón. The federal and local governments continue with the irresponsible and failed “strategy” implemented since 2006. Faced with any problem, they send more troops, police, and weaponry to “calm” the area, which predictably only begets more violence and blood. The tactic of “decapitating” major drug traffickers, such as El Z-40, also continues by orders and information from the U.S. government. The exaggerated accolades from Barack Obama and Janet Napolitano for Peña Nieto remind you of the comparison that the U.S. president made in 2010 towards Calderón comparing him to the supercop ‘Eliot Ness’ of the “Untouchables”. 'Centro Federal de Readaptación Social Número 1 "Altiplano"
No.1 is Mexico’s only recognized “Supermax” prison; its history is free from escape, so it can be no surprise that the most notorious capos are sent to No.1 for incarceration. Located Santa Juana neighborhood of Almoloya de Juárez, in the State of Mexico, detailed attention has been given to prevent escape, overhead airspace is restricted, cell transmission restricted to 6 miles, 3 foot thick walls, regular polygraphs given to all level of personnel, an armored vehicle convoy, state of the art technology that can pin point the logistics of equipment and people, and officers trained in repelling escape, are on site and ready to react in the event of an escape attempt. Now that he is formally charged, Miguel Treviño Morales resides in Altiplano No.1 Prison, transferred from PGR facilities in Mexico City. He now accompanies those on a long list of notorious narco-bigs who were housed there in the past and those presently incarcerated at No.1; Édgar Valdez Villarreal "La Barbie" BLO, Miguel Ángel Félix Gallardo "El Padrino" "The Godfather, Gerardo Álvarez Vásquez, alias "El Indio" BLO, Joaquín Archivaldo Guzmán Loera, alias "El Chapo" Guzmán Sinaloa, to name a few. [Chapo was transferred in 1995 from No.1 to Puente Grande Maximum security prison in Jalisco. He escaped from the Jalisco prison 6 years later]. The United States have filed for the extradition of Miguel Treviño where there is an indictment waiting for him. The prison is under the direction of a woman, a psychologist named Marissa Quintanilla. Quintanilla, who has both an economics degree and psychology degree, has been assigned to No.1 for a year, but has 14 years working in the federal prison system, in Guasave Sinaloa and Matamoros, Tamaulipas. Quintanilla literally lives at the prison. 24/7 it is her home. The self-imposed “incarceration”, is a self-preservation necessity. She was asked when she is able to sleep, “I get very little, but even if it is three hours, it is comfortable, relaxed sleep, I sleep very well”, answered the director. 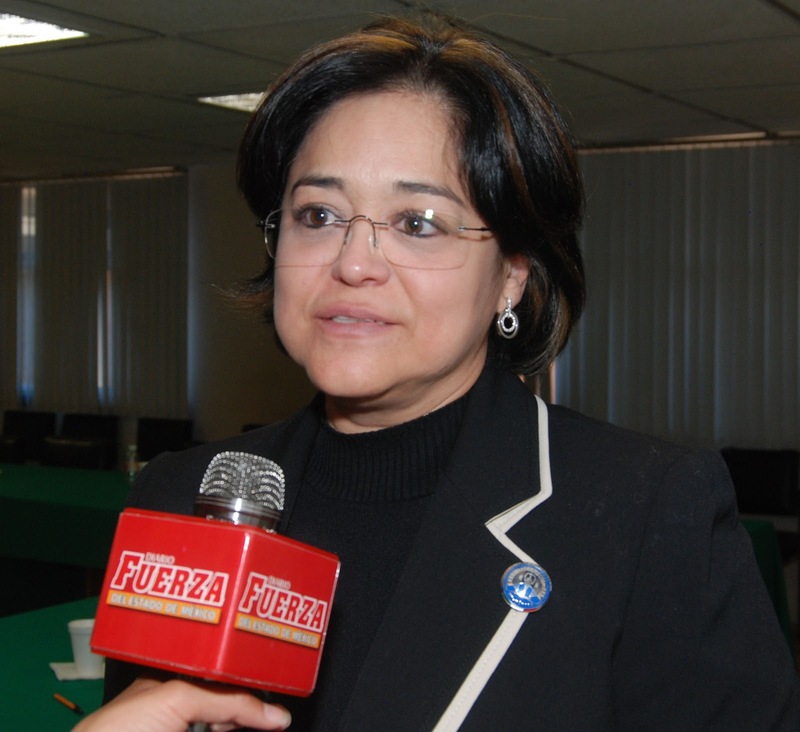 Quintanilla speaks about the consequences of being director of a prison such as Altiplano No.1. "My family is far away, very secured. Though they are very proud of my work, they are also sad, because at this time it has been 16 months of not seeing my mother”. She believes in the rehabilitation of these offenders, with the help of their families and society, in working together the rehabilitation of offenders is possible, that treating offenders in a humanizing manner will have a positive impact. Over the top humanizing say her critics. 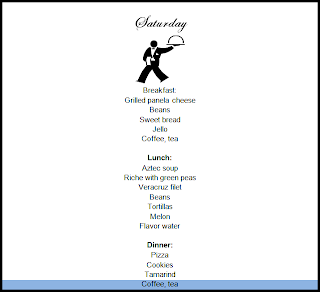 From the “narco-menus” [click any image to enlarge], to the private visiting rooms, sans bars, she has been criticized for her approach, which her detractors tag as dangerous and “soft”. "I am asked; hey why do so many things for the offenders, how do you think the victims feel? I answer that my role is not working with the victims; it is to work with offenders, to rehabilitate, so in that way the institution does something for the victims, and society, by working for the prevention of crime. " Other features of Quintanilla’s prison plan for inmates are offering education through high school, and work shop and training, utilizing outside businesses contacted with the prison. The prison population has grown to 1,200 inmates with plans for expansion. 250 inmates are deemed “high risk” or “dangerous”, having been sentenced for Offences of Drug Trafficking, kidnapping, Organized Crime operations. As for fear, she maintains healthy fear is good, it keeps you alert in your surroundings, allows good decisions, but the type of fear that can be paralyzing to the point of paranoia, you will miss signs and that can result in you losing your life. According to information made public in 2011 the cost to feed inmates was about 4 USD per day. There are no current figures made public. I can say from personal experience, the kitchens I have constructed in Mexico for impoverished children serve meals at 12 cents or less per meal. The state entered agreement with the foundation to; train volunteers [usually mothers] to prepare food and hygiene, a certified nutritionist creates the balanced menu, and the food is delivered to the site and we are charged government or surplus prices. The meals are nutritious but far from the fancy food on the narco-menus. 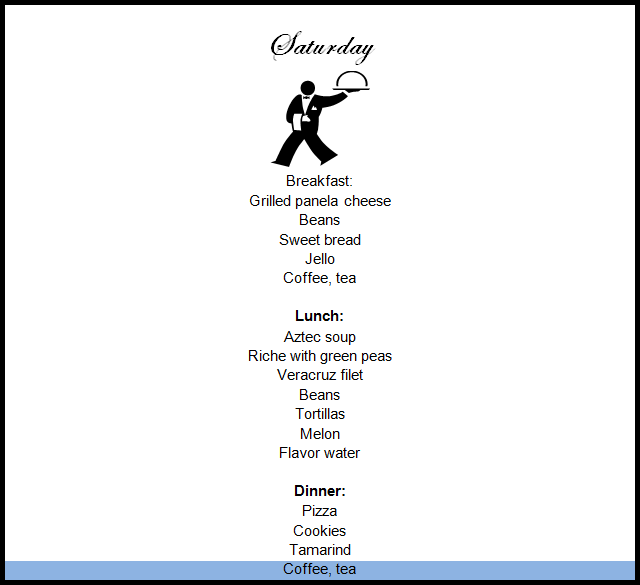 We serve breakfast for the morning school session, and dinner for the afternoon. Food ranges from pancakes, scrambled eggs, fruit and carton of milk for breakfast, to ham and cheese sandwich, fresh fruit, soup and juice or milk for dinner, everything is prepared fresh on site in our kitchens. We also use a lot of soy which the children like. We supplement the meals with a snack, such as a biscuit and drink, or frozen fruit bar depending on the weather. From El Universal, below is a video tour of the prison with Quintanilla translated narrative follows. Narcomenu: What do capos in prison eat? A total of seven individuals have been killed in ongoing drug and gang related violence in Mexico's La Laguna region Monday, according to Mexican news accounts. Newa accounts which appeared on the online editions of El Siglo de Torreon and El Diario de Coahuila say that five unidentified taxi drivers were gunned down at a taxi stand in Ciudad Lerdo, one of the larger towns in La Laguna region of north central Mexico. According to the reports, the shooting began at about 1330 hrs when armed suspects with AK-47 rifles fired on the victims in the Centauro del Norte colony near the Ciudad Lerdo to Juarez highway. At the moment reports fail to make clear if anyone survived the shooting other than one unidentified man who was taken for medical treatment. Only an hour before in Gomez Palacio, which is directly adjacent to Ciudad Lerdo, two men were shot to death near a primary school. The victims were identified as Ruben Huereca Gaytan and Jesus Rivera Rangel, and were shot near Benito Juarez primary school in Bellavista colony by armed suspects using AR-15 rifles. The La Laguna region which comprises several western Coahuila and eastern Durango municipalities, recently underwent a change in its security status when it was announced that the Mexican Army would take over all police functions. Until that announcement, La Laguna had suffered with a high amount of criminal activity including armed robbery. 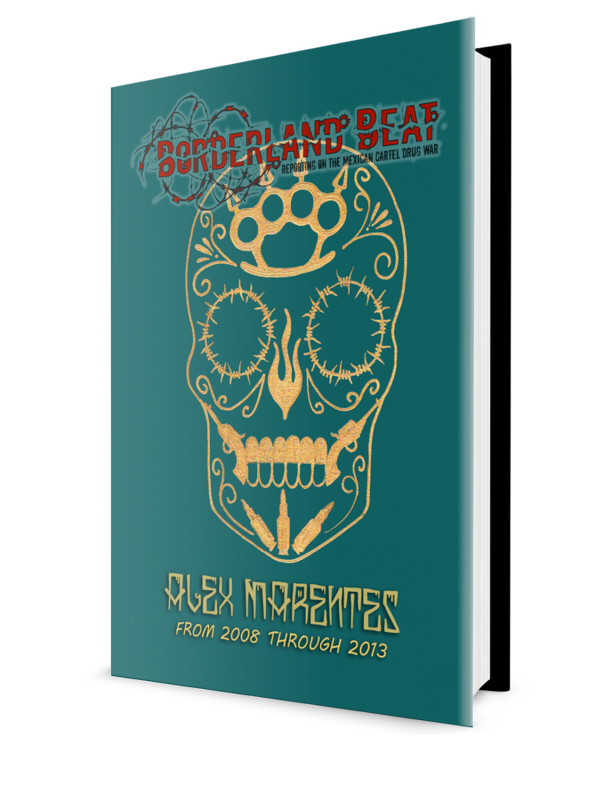 Gomez Palacio had had part of its police department dismissed earlier in the year and were disarmed by the Mexican Army enforcing the Explosive and Firearms Act. Mexican federal information policy makes it nearly impossible to gauge how well Mexican federal security operations in the region fares, but as with several other regions in Mexico including La Laguna, La Tarahumara and northern Tamaulipas, it appears that federal security elements may have been redeployed to Michoacan to deal with the renewed violence in that state, leaving the other regions with reduced security deployments. In other security news in Coahuila state a total of eight unidentified suspects were detained near the town of Cuatro Cienegas by Coahuila state Policia Estatal units, according to a news account posted on El Siglo de Toerreon. The suspects were detained on a variety of offenses including murder, kidnapping and extortion. Vice Admiral Carlos Miguel Salazar Ramonet was Commander of the Eighth Naval District based in Puerto Vallarta, Jalisco. He was in a military vehicle with his wife, two military bodyguards and a driver, traveling the Mexico-Morelia highway. A protest forced him to take an alternate route, where he was ambushed and killed. The victim was the Second Section Chief of the Secretary of the Navy of Mexico and also head of Naval Intelligence. 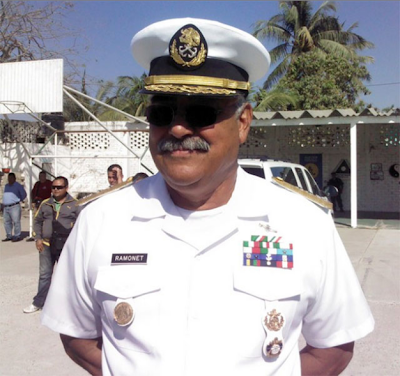 In 2011 Miguel Salazar was appointed to Vice Admiral. On January 16, 2012 he began work in the eighth Naval Zone. Previously he was naval attache in Panama. Salazar Ramonet is the first person of high-ranking stature to die in Enrique Pena Nieto's administration in the context of the anti-crime fight. Along with the Admiral, a naval bodyguard died and two others were injured. 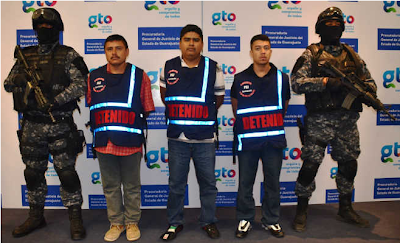 Ministerial authorities revealed that the navy arrested three suspects, who were transferred last night to the Deputy Attorney Specialized Investigation of Organized Crime (SEIDO), in Mexico City. They are said to be members of the Knights of Templar according to the States Prosecutor, Jesús Murillo Karam. In this way, the crew of the Suburban were intercepted by gunmen in two trucks, who blocked their way and demanded identification of the Vice Admiral and his companions. It was noted that the commander of the Eighth Naval District was traveling as a civilian. In the attack, Salazar Ramonet protected his his wife, who was injured along with the driver, while the commander's assistant also killed. Murillo Karam explained that the three detainees confessed to being members of the Knights Templar, and they charged 7,500 pesos for various crimes of extortion, robbery and other criminal acts on behalf of that group. Eduardo Sanchez, spokesman for the Office of Security of the federal government, said that the detainees were identified as Timothy Vargas Infante, José Trinidad Arroyo Regalado and Ramiro Barajas Alvarado. The suspects were arrested in possession of four guns and a short, all exclusively use of the Armed Forces. The PGR opened an investigation on charges of homicide, assault and violation of the Federal Law of Firearms and Explosives. In the past six years the drug cartels have killed soldiers, Marines and federal, state, and ministerial police,. 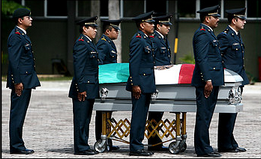 However, the greatest impact crimes were committed against 3military personnel, including Mauro Enrique Tello Quinones, Brigadier General, in Cancun on February 3, 2009. Mauro Enrique Tello Quinones was killed along with a lieutenant and a soldier, their bodies dumped in the free highway Cancun-Merida. 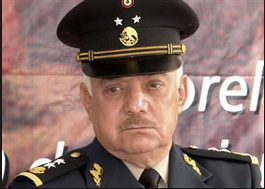 The General became the first senior military victim of organized crime in the past six years. Vice Admiral Ramonet Salazar traveling in an official vehicle on Mexico-Morelia highway and was accompanied by his wife, two bodyguards and driver. At a toll before Ecuandureo they were warned blockages on the Atlacomulco-Guadalajara Highway because a group was protesting. They decided to take another road, where they were attacked. The Navy issued a statement in which it reported that the attack occurred at noon on a road located between the towns La Noria and Las Cruces, in Churitzio. 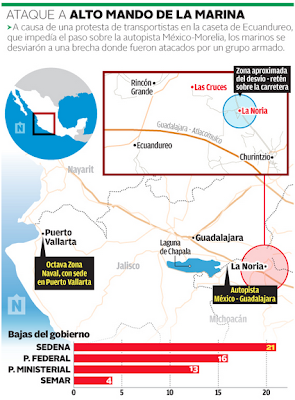 "Elements of the Navy of Mexico, on the Mexico-Morelia highway, diverted to a alternative road, about 1.5 kilometers southwest of La Noria, Michoacán, where they faced people with guns who opened fire on the official vehicle. "As a result of this unfortunate incident two members of the were killed, including Vice Admiral, Carlos Miguel Salazar Ramonet, Commander of the Eighth Naval District based in Puerto Vallarta," said representative of the military institutio. Federal authorities said that the death of naval officer was circumstantial, he was heading to Puerto Vallarta to resume work.They made it clear that this was not part of the groups of soldiers, sailors and federal police officers mobilized Michoacan last week to restore order. A few days ago the Federal Police was the victim of seven ambushes, which left at least 24 people, including four policemen and other criminals. The authorities stressed that Mexican Army personnel and the Marines moved to the area where the admiral was killed for the whereabouts of the criminals. Secretary of the Navy expressed his condolences to the families of the two Marines who "dedicate their service to our nation." 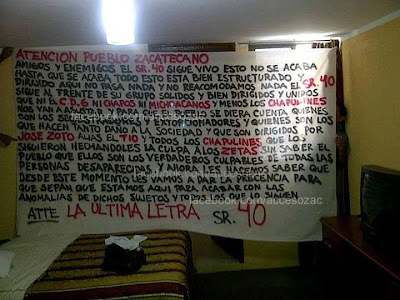 Narco-Mantas (banners) appeared in Zacatecas including one that may be a "first", a manta displayed in a hotel room. 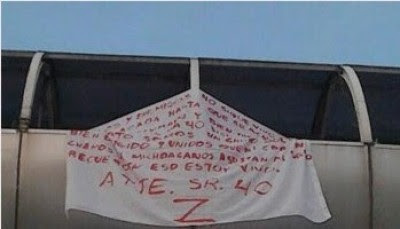 The mantas first appeared in Tamaulipas, then Coahuila now Zacatecas, with a message from and signed by Los Zetas. "From this moment we will make presence so you can see that we are here", was the theme of several messages that appeared in cities of Zacatecas, including Fresnillo, Guadalupe Zacatecas and the city of Valparaiso. 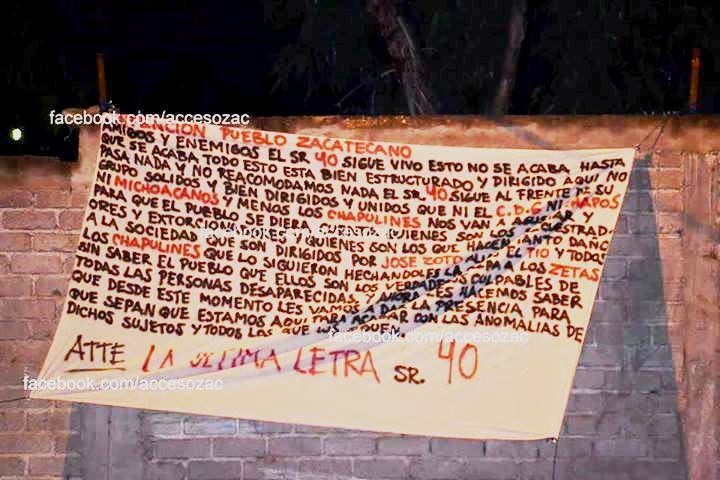 The mantas were addressed to the people of Zacatecas, declaring that though their premier leader Miguel Treviño Morales, alias Z40, was captured, there is no leadership change and he continues to lead the cartel, reiterating the group is well structured, and nothing has changed. 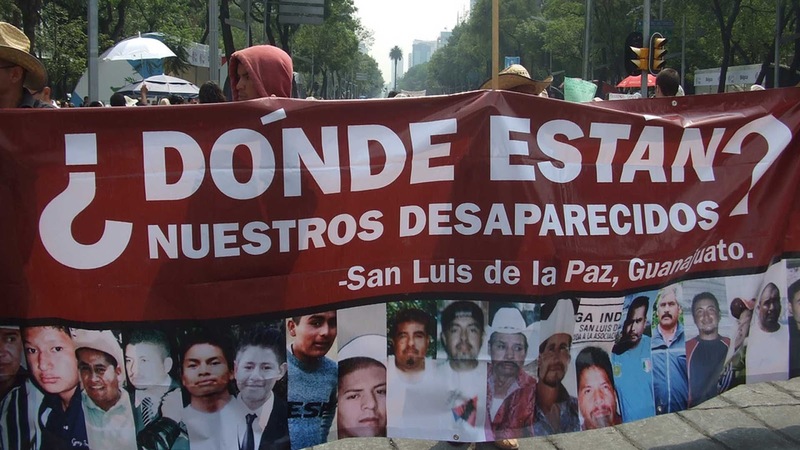 Something new with these mantas is the message that the “real culprits” in the disappearances of people in the state, are the group who called themselves “Chapulines” (grasshoppers), led by “el Tio”, José Soto. The message says; "be aware they are the ones who are causing so much damage to society". In conclusion the message announces that Los Zetas will make their presence known “for all to see we are here”. The mantas are signed “The Last Letter and Señor “40”. Proceso is reporting that in Guadalupe a group of reporters, correspondents and photographers flocked to report the discovery of a beheaded body, in an empty lot in privada los Limones street in the community of St. Jerónimo, located about 15 kilometers from the capital. When they arrived at the site, agents of the Federal Police who were at the site let them pass without problems, but as they got closer a Ministerial Police Commander blocked them and ordered the preventive police to get them out and to record their names. Reporters asked to be allowed to do their job, but the Commander of the Ministerial argued that it was prohibited to take photographs and demanded the agents to get the reporters out by using whatever means necessary. It was then when one of the police officers raised his AR-15 rifle, while the other barked to reporters: "leave, do not hinder the investigation. Imagine if the dead were a cousin, a brother or family member, you would not like photos to be taken to publish them, right?" Seemingly, the officer was attempting a new tactic to block freedom of the press, tugging at the heartstrings of reporters. Someone needs to tell the officer that his appeal may be more effective without aiming the AR-15 at the reporters. 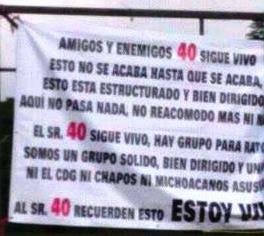 Friends and enemies, Señor 40 is still alive, this won´t be over until it´s over, all this is well structured and managed, nothing happens here and we don´t rearrange anything, Señor 40 is still the leader of his group, solid and well managed and united so neither CDG, Chapos or Michoacános and even less the Chapulines will scare us, and so the people realize who are the kidnappers and extortionists and who are those who harm society, it is those who are led by José Soto alias el Tío and all the Chapulines. Blaming the zetas without the people knowing that they are the real culprits of all the disappeared people. And now we let you know that from now on we are going to show our presence so you know that we are here to finish with the anomalies of said subjects and all those who follow them." On Tuesday a kidnapped 17 year old was rescued from a well. 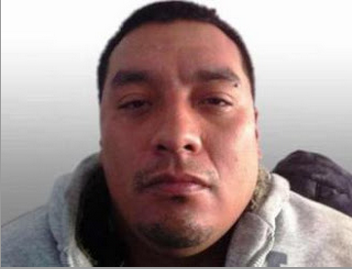 He was kidnapped in Fresnillo, Zacatecas. His father is a judge and the kidnappers had demanded 400.000 pesos. 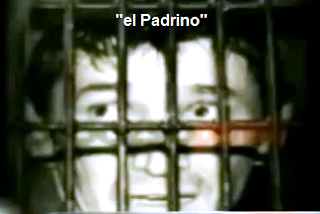 They stole his car, beat him and threw him in a well in Estación San José, near Fresnillo. On Tuesday morning a man who was working in the fields found the teen in a well and called the authorities. He was rescued and alive and transported to a hospital for treatment. 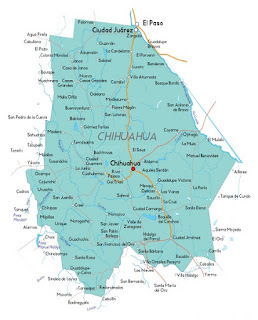 In what amounts to be the most frank discussion of a state official in Mexico's six year war on the cartels, last week Chihuahua state attorney general told Mexican press that the area in southern Chihuahua has a "grave problem" in security, according to Mexican news accounts. 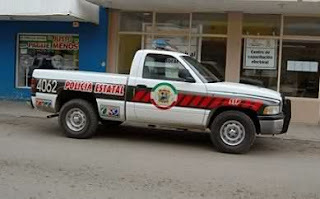 The report which appeared in an online edition of El Norte Digital, Carlos Manuel Salas, Fiscalia General del Estado (FGE) said that the problem with crime in southern Chihuahua state particularly around Guadalupe y Calvo municipality is compounded by the lack of state and municipal police personnel. According to the report, Salas said the the dramatic reduction in murders in Chihuahua state has been realized in Ciudad Juarez and in Chihuahua, the state capital, which he said was because of state efforts in those areas to reduce violent crime. "It is not a pretext," Salas was quoted as saying. "The territory (in Guadalupe y Calvo) is vast, we continue to work and the help of the army is more intense." He also said that more police are being appointed and that cooperation with the military is increasing. But Guadalupe y Calvo municipality is not the only southern and western municipality affected by violent drug related crime. 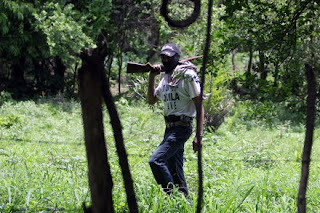 A column which appeared Saturday in the online edition of El Diario de Juarez news daily by Javier Flores Luis Valero, quoted a count provided by Reforma news daily that 40 people have been executed in the last 60 days in several remote mountain communities in the sierras of Chihuahua, including Guadalupe y Calvo, Madera, Balleza, Bocoyna and Moris in just the past two months. Those municipalities compose the Chihuahua state part of La Triangulo Dorada or Golden Triagle. 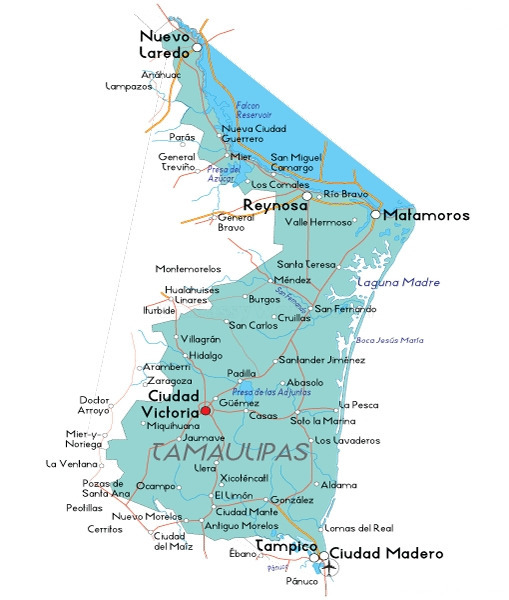 The communities are also part of the area called La Tarahumara, after an Indian tribe which resides in the area, colloquially known as the Raramuris. According to the same report, data compiled by staff of El Diario de Juarez indicated that the murder rate statewide is about two per day, which is well above the average in 2007, when then Mexican president Feilipe Calderon Hinojosa began to use his military against the drug cartels. According to the report murder statistics are on track to rival the 755 murders in 2012, the high water mark for violence in Chihuahua state. The report dismisses the government's claim that federal and state efforts have been instrumental in the documented reduction of violent, but the report claims the reduction is more likely fighting between criminal gangs have shifted from the cities where the most noticed reductions have taken place to ares such as La Tarahumara. Another disturbing long term trend has been noted as well. According to Jose Antonio Ortega, president of the Consejo Ciudadano para la Seguridad Pública y la Justicia Pena or Citizen's Council for Public Security and Penal Justice, compounding the problem of violence has been impunity, or the lack of criminal convictions for the crime of murder. A separate news item which appeared in El Diario de Chihuahua news daily last December said that the conviction rates for murder in Mexico nationwide in 2012 are the second lowest since 1997, and has been declining since 2007. Specifically in Chihuahua state, in 2005, 326 were convicted for murder, while in 2012 145 were convicted and in 2011, 199. The state government of Chihuahua is under increased pressure from residents in La Tarahumara. 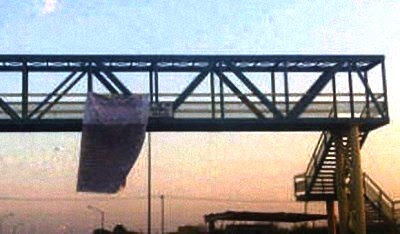 According to a news account which appeared in the online edition of Yancuic.com, a letter sent to governor Cesar Duarte Jaquez last July 6th has criticized the state government for "shouting from the rooftops" about the reduction in violent crime, while violence has been increasing in the area. 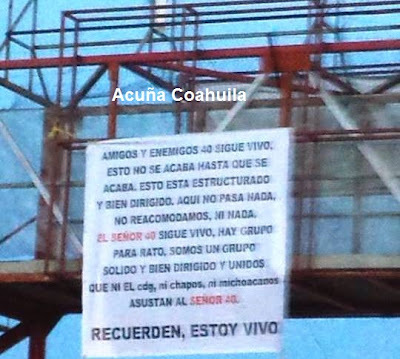 The letter was signed by 100 residents of the region including a sectional president of Creel in Bocoyna municipality, Salvador Bustillos, and Javier Avila, a Jesuit priest who is part of a human rights group in the area, Comision de Solidaridad y Defensa de los Derechos Humanos, AC. The letter says that residents of the region have complained repeatedly to authorities about murder, kidnapping and assaults only to be greeted with more murders, kidnappings and assaults. Another problem in the region, as with Guadalupe y Calvo municipality, is the constant existence of checkpoints operated by criminal groups which rob residents in the area on pain of having their children assault or raped. 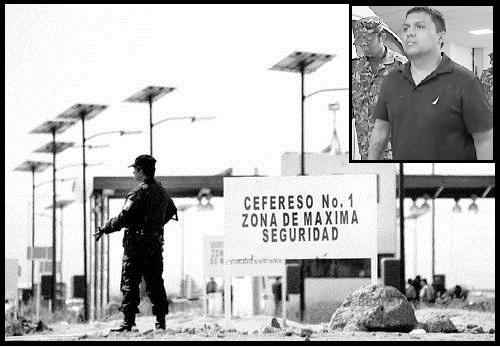 What is most astonishing about the charges against the government is that the Mexican Army maintains at least one permanent infantry company base in Creel municipality. The authors complained in the letter that government officials have little problem in coming to the area to boast projects, but have failed to have a dialogue with constituents about security issues. Governor Duarte for his part, has dismissed charges of increased violence in La Tarahumara, and has apparently failed to address concerns in the letter. He said the letter was a " political manipulation of reality". He said the violence in the region not as bad as in Michocacan state. In Michoacan state, by all press reports, the Mexican government has claimed to have 6,000 federal security effectives in the region. However, that number is dwarfed considerably by the number report only a little over a year ago where then Mexican president Felipe Calderon had maintained some 8,000 federal security effectives in the region. Since the Mexican federal government maintains an effective clamp on drug war news, it is impossible to say if the 6,000 troops are the total in the state after a February, 2013 promise to sent about 1,000 troops to the area or in augmentation to that number. In his inauguration speech three years ago Governor Duarte pledged a crackdown on crime to include life sentences for kidnapping. Despite the current claims of additional federal security, violence in the Michoacan has skyrocketed. Violence in Chihuahua state has also become grave enough that Duarte's Fiscalia had to respond. It was 10:00 p.m. on a good day in 1947, when a police patrol vehicle left the Municipal government building and headed west from the city, to a place known as "La Piedrera" ("The Quarry"), which was used to extract material for public works projects. The passengers in the patrol vehicle included the mayor, Carlos Villarreal Ochoa, the Police Commander, Col. Rosendo de Anda, and a parent who some hours earlier had gone to the mayor to ask for justice because they had raped and murdered his 14 year old daughter. The individual accused of committing these crimes was there, too. --You want justice? Here's my .45. Cut him down!" said Villarreal to the grieving father, who had not expected to be placed in a situation like that and was barely able to utter an "I can't do that, Mr. Mayor." --You are such a coward", the Mayor upbraided him. Then Villarreal grabbed the weapon, loaded a round and aimed it at the evildoer's head. The blast broke the night's silence in that remote place. It was just one shot. The accused fell, lifeless. Seconds later, the patrol vehicle left the place with one less passenger, to return to the Mayor's office. 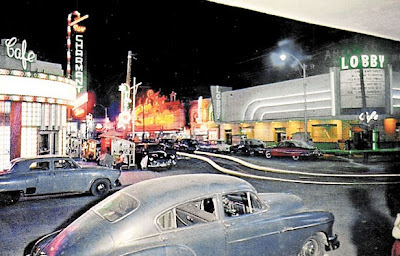 The anecdote was narrated years later by the mayor himself to the lawyer Filiberto Terrazas Sanchez, then a criminal court judge in Juarez and currently the city's chronicler. 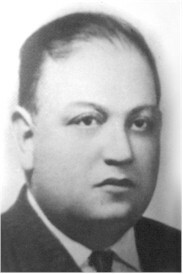 With a character forged during the years of alcohol Prohibition in the United States, when he was imprisoned for smuggling liquor, Villarreal Ochoa was municipal president from January 1 to February 17, 1947, then from February 25, 1947, to December 31, 1949. When he took office, the city was undergoing a period of insecurity and violence caused by the recent upsurge of bars and whorehouses that serviced U.S. soldiers, and the proliferation of drugs and gangs. The "heavy hand" that he applied to crime was facilitated by the opportunity to to avoid judicial proceedings, which allowed him to impose summary judgments against disturbers of public order and political enemies; in six months, he was able to pacify the city to the degree that its inhabitants slept with windows and doors open, says Terrazas Sanchez. The seal he imposed on his government earned him fame that endures to this day, surrounded by myths and legends, but substantiated by the violence he used to combat that same violence. Originally from Inde, Durango, where he was born on December 23, 1904, Villarreal Ochoa came to Ciudad Juarez at the age of 19. He quickly found employment in the groups that were formed on the border to consolidate the alcohol industry, which supplied the Western United States during the Volstead Act. Politicians also came out of those groups. During that period, Juarez experienced an economic boom that diminished when the Volstead Act was repealed in 1933. However, after 1941, there was a resurgence when the North American government got involved in the Second World War. The economic impact on the border was direct, since Fort Bliss grew until it became the third largest military base in the United States, with close to 25,000 soldiers stationed there permanently, of which at least 10,000 would cross the border into Juarez every weekend to relax, faced with the possibility they would be shipped to the front. At the same time, the Bracero Program was implemented, drawing thousands of Mexicans looking for work. Nevertheless, when the program ended, hundreds continued to arrive, many to remain in Ciudad Juarez. The misconduct broke out soon, public insecurity problems caused by gangs, narcos, pickpockets and bar brawlers. Of the gangs, the most representative were "Los Pachucos" and "Los Tirilones", while the consumption of heroin and marijuana became more and more widespread. Three videos of a firefight between organized crime and federal police after the federal police where ambushed in Barranca Seca, Michoacan de Ocampo. Lately the federal police and military have been involved in clashes with organized crime in around Michoacan. 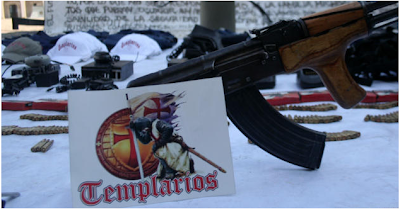 The Knights Templar are fighting hard for control of Michoacan. Some federal patrols have been ambushed and many officers have been killed in the last couple months. The "comunitarios" or communty police have taken arms and many have been killed also, mostly abducted and executed, but at times is hard to tell who is who. This must be very difficult for law enforcement to attempt to tell who are the good guys when large groups of men are patrolling while heavily armed on the outline areas of Michoacan. Very little information is coming out of the region and it's hard to tell exactly what is happening. We are all relying on social networks like Facebook and Twitter to try to get as much information as possible. Laredo, was an key figure in the collapse of Z-40. officials and weapons in Nuevo Laredo. Ministry source cited by Reforma. of guards they used as well as the registration numbers of their vehicles. many Z-40 operatives used to live. Los Zetas kept captured migrants. under the command of Trevino Morales. The phenomenon of missing people began to become evident beginning 2007 in areas disputed between organized crime groups and law enforcement. The testimony is from a young girl in Chihuahua. It is not a story of those who whisper during family meetings dedicated in the search for one of their own—lost, kidnapped, or missing—those who realize that not all of those who are missing are dead, some are living, enslaved; this story contains data, names of towns, and descriptions of criminals. -And how do you know that? –they asked. -My brother would tell us. -One day he managed to go to the top of the mountain and called my dad to say he was fine, but that they treated them badly. 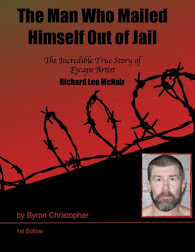 One day he came home…He said that there was a shootout…he had escaped. Zeta Message:"We are a Solid Group, Well Directed and United"
Narco mantas signed by Zetas appeared in Valle Hermoso, Tamaulipas and throughout the state. The message it indicates that there will not be a change in leadership. I had suggested after the capture, that Z40 would continue to make the major operational decisions, which is what this manta alludes to. It is feasible due to the accommodations provided at Altiplano No.1. To all groups, friend and enemy, "40" is still alive, it isn't finished until it is finished (the conflict), we are well structured and well organized, no passing has occurred (as in leadership), no rearrangements. 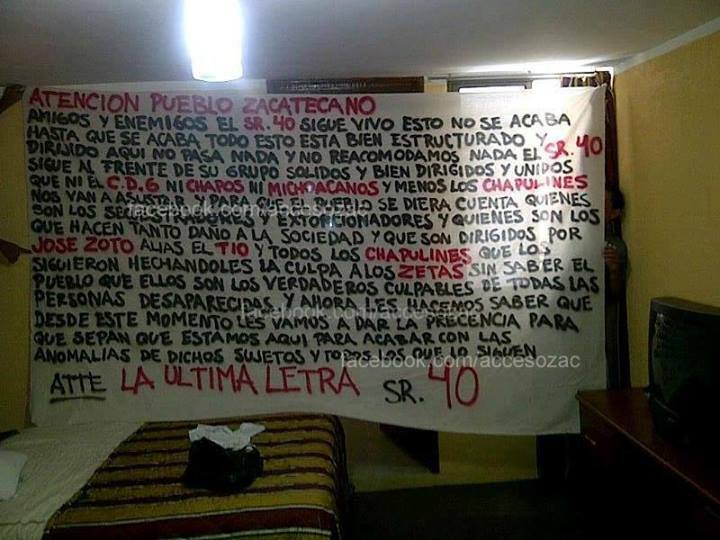 Señor "40" is still alive and we have been a group for a while,( meaning they are well established) while) we are a solid group, well directed and united CDG, Chapos and Michoacán do not scare us. Thank you to "Jose", "Sofia" and "Lacy"
Celaya. - Attorney General of the State, Carlos Zamarripa Aguirre, confirmed the arrest of a leader of the Knights Templar criminal group and several other members of the organization. Through his Twitter account, the state prosecutor said the arrest was made in a joint operation of the Immediate Reaction Task Force (GERI) of the Attorney General and the tactical group of the Ministry of Public Security of the State. "He was arrested in the city of Celaya along with several others involved for the executions of several people last weekend," the official posted. In the operation they secured various ballistic equipment and firearms, while detainees are involved in at least eight executions and kidnappings. Agustín Martínez Hernández, El Kalimba, the principal leader of the The Knights Templar cell in Celaya's arrest was confirmed yesterday. 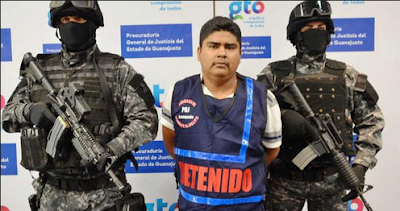 The 22 year old, claimed to be a native of Guerrero, Acapulco and was arrested in an operation between the state attorneys office and the state Public Safety Department. As the head of the Knights Templar's Celaya plaza, Agustín Martínez Hernández is accused of murdering three people in Jacarandas, perpetrated last Friday. El Kalimba has arrest warrants issued by judges for the first instance in Celaya. So far Martínez Hernández has proved his participation has been straightforward in five homicides committed with firearms, mostly super 38s .The prosecutor reported that he is being investigated for his alleged involvement in at least six other murders, so thorough research and integration of relevant investigations continue at this time. At the scene of the arrest, two super .38 guns were seized, a truck, and a Renault SUV reported as stolen in Toluca, State of Mexico. In the operation, also arrested were Luis Gonzalo Andrade Delgado, El Chaparro, 25, a native of Uruapan, Michoacan, and Fabián Castan Cruz, 34, of Celaya, Guanajuato. This cell of the Knights Templar was operating not only in Celaya, but also in the area south of Guanajuato especially in those municipalities close to the border of Michoacan. The Secretary of State for Public Security, Appendini Alvar Cabeza de Vaca reported that it achieved significant arrest of "boss" of the Knights Templar criminal organization. For his part, Guanajuato Governor Miguel Marquez Marquez, said that this intervention is a clear sign that Guanajuato has not let down its guard on safety, and there is still very significant coordination between different levels of government, federal, state and municipal. He continued saying that in the case of Guanajuato, during ongoing monthly meetings with the governors of the zone, it was decided that fortifying and shielding the borders could only possibly be achieved through a coordinated effort. 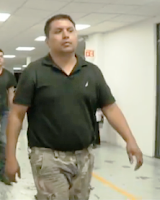 A federal judge today held over for trial and formally charged, Miguel Angel Treviño Morales, aka Z40 , on charges of operations with illegal proceeds, money laundering and weapons charges, including possession of weapons and cartridges exclusive to Mexican armed forces. The Fourth District Court, based in the city of Toluca, State of Mexico, handed down the ruling at 13:30 hours on Thursday, said the spokesperson of the Council of Federal Judiciary. The charges against Trevino, the premier leader of the Los Zetas cartel, are considered serious; however, noticeably missing are charges of murder for the killing of 265 economic migrants in San Fernando Tamaulipas. 193 migrants were discovered in mass clandestine graves known as “narcofosas” and 72 migrants found massacred at an abandoned San Fernando ranch. 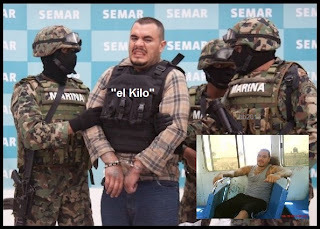 There are problems with charging Treviño with the murders, since Martín Omar Estrada Luna aka “El Kilo”, pled guilty to being one of authors the murders, and admitted he was only given an order to recruit but “things got out of hand”. Additionally, there was a Zeta order from the top, after the 72 migrants were killed, to execute those responsible for the slaughter. 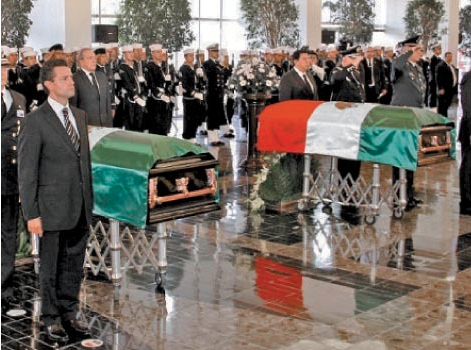 On September 5, 2010 the bodies of three alleged Zetas sicarios were dumped in Tamaulipas with a narco message indicating they were directly responsible for the killings. Given those facts it would seem that a strong case against Treviño is lacking , for being culpable in those specific migrant murders. The charges filed against him today, though serious, would be a far cry from charges that would keep him incarcerated for the majority of his natural life. The court is able, and assumedly, will amend/add the charges filed against the cartel leader. It should go without stating, but in case anyone wonders, Treviño does not qualify for bail. He is able to file an appeal to contest the charges. With the ruling issued Thursday, Treviño will continue to be incarcerated, to trial, at the federal maximum security prison of El Altiplano No.1, located in the municipality of Almoloya de Juárez, in the state of México. The Mexican judicial system is currently in transition. Mexico has adapted the American style of judicial system and has until 2016 to fully implement the system into practice. Although the US has provided support, such as training of Mexican prosecutors by American federal prosecutors, there has developed a stalling of the process and it is now unclear if all states will be in compliance 2016 date mandated by the Mexican constitution. It is also unclear what affect the new judicial system, if any, in the prosecution of Miguel Treviño, as he will go to trial in the state of Mexico, one of the 3 states in full compliance and operating under the new system. The following information was derived from: the State Department, US Consulate, Woodrow Wilson Center and The CRS Report prepared for US Congress. A fundamental difference between the U.S. and Mexican legal systems is that Mexico is a "civil law" country while the U.S. is a "common law" country. Common law emphasizes case law relying on judges’ decisions in prior cases. In contrast, Mexico's civil law system is derived primarily from Roman law and the Napoleonic Code and focuses more on the text of actual laws than on prior court decisions. In the U.S., even one case can establish a legal principle and lawyers need to analyze many cases to interpret the law. In Mexico, one studies the law and makes the best argument given the facts. For an accused person, one of the most critical differences is that under Mexican criminal law, the accused is essentially considered guilty until proven innocent. Mexico does not allow bail on personal recognizance and therefore a cash bail must be posted (which may not be available depending on the potential sentence). 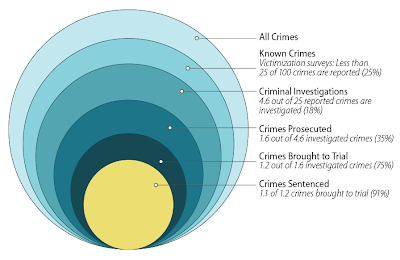 Many activities that are not considered crimes in the U.S. may be crimes in Mexico. Additionally, the role of judges in Mexico is broader than in the U.S. Mexican judges are active in developing a case and gathering evidence. In the absence of jury trials, judges also make the ultimate decisions about the innocence or guilt of an accused. 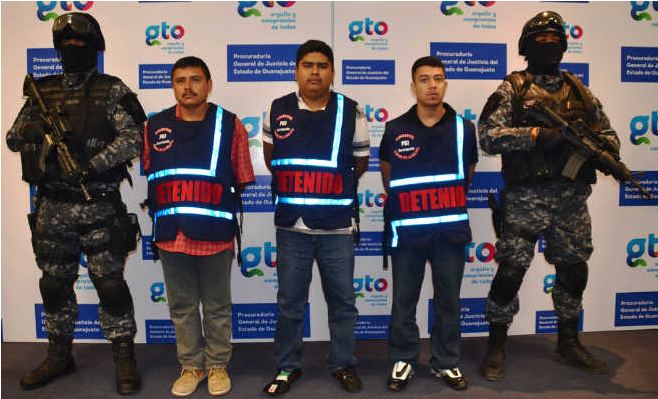 If you are arrested for a serious crime in Mexico, the police will turn you over to the agente, or district attorney’s office which could be state or federal, depending on the charge (Serious crimes under federal jurisdiction include, for example: drug possession, alien smuggling, certain firearms/ammunition charges, and possession of counterfeit money. The district attorney’s office will then conduct a preliminary investigation to determine if the case should be prosecuted. If they decide to prosecute, the case will be turned over to a judge. The DA’s office, state or federal, can keep you in custody up to 48 hours (unless they receive an extension) before deciding whether to charge you. By the end of the 48-hour period, the district attorney must turn your case over for prosecution, set bail, or drop the charges and release you. If bail is not set, or if it is set but you can’t pay it, your case will be turned over to a court and you will be moved to a different facility. Video: "I Was a Hitman for Z40"